At Roseville Diagnostic Hearing Center, Inc., we take pride in continuously learning about and delivering the most advanced hearing technology so that we can provide the greatest value to you. Phonak CROS B is a significant leap forward in technology. We would love for you to experience this amazing technology firsthand. 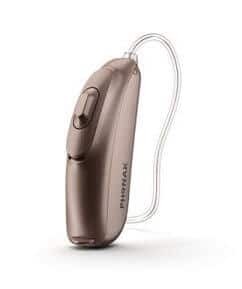 CROS B will transmit sound from one side to the other, letting you hear sounds and voices all around you. If you have better hearing in one ear and poorer hearing in the other, then CROS B is the perfect solution for you. Featuring AutoSense OS™, CROS B automatically adjusts to your environment, which allows you to focus on what you want to hear. Enjoy a walk in the park with friends, dinner with your loved ones, or even a road trip across the country, thanks to the technology in Phonak CROS B. Call (916) 780-4200 today to schedule an appointment for a no-obligation demonstration of the new Phonak CROS B. Join the conversation; your friends and family are worth hearing.